His Eminence and Most Reverend Cardinal Joseph Ratzinger, Prefect of the Congregation for the Doctrine of the Faith during the Pontificate of His Holiness Pope John Paul II, has been chosen by the Holy Spirit as the Supreme Pontiff of the Holy Roman Catholic and Apostolic Church, precisely in these times in which the Era of the third Divine Fiat begins, as the fulfillment to the petition of the Our Father: “ Adveniat Regnum tuum. Fiat Voluntas Tua sicut in Cœlo et in terra”. And His Holiness Benedict XVI knows about it, as God had prepared him over time making him know and study the writings of Luisa Piccarreta, “The Little Daughter of the Divine Will”, chosen by God for the mission of opening the doors of the Kingdom of the Divine Will on earth as it is in Heaven. It was in the year 1989 when José Luis Acuña (my father), who lived in Atlacomulco, Mexico, gave to his bishop His Excellency Mons. Ricardo Guízar Díaz, the last book of Don Octavio Michelini that he had translated and published: “The Cup is Overflowing”, with an Appendix written by himself. Four years previously, in 1985, when my dad had bought a house in this diocese to live with us his family, he went to greet our bishop and to introduce himself personally, as he had already been in contact with him once, precisely because of the two previous books of Father Michelini translated and published by him; Mons. Guízar had requested these books for priests of the diocese of Aguascalientes, in which he was the auxiliary bishop, before being made the first bishop of the then recently established diocese of Atlacomulco. Since then they had established a spiritual, cordial and respectful relationship; my dad, together with my mom, Marcela Rincón de Acuña, visited him once in a while and took advantage of this to talk to him about the writings of Luisa Piccarreta and give him some of those he had already translated. In August 1986 His Excellency went to consecrate our private chapel, dedicating it to the Virgin Assumed into Heaven, and every August 15th he would celebrate mass in that chapel. “God’s decrees are eternal and there is nothing or nobody that can impede them to be carried out. The creation was an eternal decree and nobody was able, is able or will be able to impede it. The Incarnation and Redemption was an eternal decree and there was nobody able to impede Him fulfilling it. In that same way: THE KINGDOM OF GOD ON EARTH AS IT IS IN HEAVEN is an eternal decree, since Jesus Himself, Eternal Incarnate Word of God, announced It asking for It and making us ask for It, and there is nothing or nobody that can impede Him in this. The harm is for whoever doesn’t want to receive the goods and the fruits of the fulfilment of those decrees, but to impede them…nobody, neither the devil, nor the wickedness of the creature, absolutely nothing or nobody! Few months afterwards, in May 1990, my parents planned a trip to Italy, to visit the places of Luisa Piccarreta in Corato. Due to the interest shown by Cardinal Ratzinger, my father thought of visiting him in order to tell him more about the Kingdom of the Divine Will in the writings of Luisa; he talked about it with Mons. Guízar and he gave my father a recommendation letter so that Cardinal Ratzinger could receive them. Once in Italy, they first went to Corato to the House of Luisa, see of the Association “Luisa Piccarreta” founded by Sister Assunta Marigliano; they had an interview with the Archbishop of Trani, Mons. Giuseppe Carata, who had recognized and approved three years before, the Pious Association, and they told him that in Italy they were going to visit His Eminence Cardinal Ratzinger. Mons. Carata told them some interesting facts so that they could mention them to the Prefect Cardinal: that soon they were going to beatify the Venerable Father Annibale Maria Di Francia, Luisa´s extraordinary confessor, Ecclesiastical Censor of the writings of Luisa and first editor of “The Hours of The Passion”, which were published under his responsibility and with his own name, making several editions in Italian and then translated into German and had been placed in the Index of Forbidden Books, and now…. they were going to beatify him? “- That I was the author of the Appendix. He remembered well the Bishop. I showed him photos of the chapel with him. He told me that this was very important in order to be united with the Church. I went directly to talk about Luisa and the writings. I gave him the abstracts that I had prepared, which he skimmed through… I explained a little about living in the Divine Volition and the current importance of the writings. That the Bishop thought they were wonderful. I told him that they hadn’t been approved, that they should be revised. That they were there in the Holy Office. That I was actually not asking this for me, but for so many souls, etc. He told me that maybe they hadn’t revised them properly (sic). I answered that maybe that wasn’t the time but that now it was, that it is already time; that it is needed to promote them. He told me that he was going to read them attentively. I also gave him the copies that Sister Assunta gave me and I told him what Mons. Carata told me: about Father Annibale Di Francia; copies of the Hours of The Passion and the Queen of Heaven published by him with his name; they are going to beatify him in October. After that I waited for him outside the chapel to take a picture with him, to put it in the chapel, to which he gladly agreed. I repeated that what pertained to Luisa was VERY IMPORTANT for the Church. He gave us his blessing and we said goodbye.In the street I met once again the Personal Secretary, to whom I also spoke about Luisa, who didn’t know, now he knows about her…I will be able to write to him, giving them more writings. When they came back to Mexico, my dad talked to Mons. Guízar about the interview with Cardinal Ratzinger. Afterwards, at the beginning of July of that same year, he selected other chapters of the writings of Luisa and sent them to the Cardinal with a letter that between other things said:The texts selected and handed to the Cardinal in both cases are the ones found at the beginning of the book in Spanish: “Selected Passages”, without a title (pp.25-49). Beatification of father Annibale M. Di FranciaThe fact of the beatification of Father Annibale is very significant, since it means that after investigating the fact of the books placed in the Index, this wasn’t an obstacle, what it is more, “with the beatification of Blessed Annibale Di Francia, his writings have also been approved by the Church, and therefore, also the prefaces to the works of Luisa” (From the Homily of His Excellency Mons. Carata on 23/1/1991 in the Church of Saint Domenico in Corato). And he was later canonized in 2004. Thus the Church has approved everything that Saint Annibale says about Luisa, her mission and her writings, and She puts him as an example for us in these times. “All of the writings of Luisa must be approved”.Subsequently Mons. Guízar went to Corato, to the Association “Luisa Piccarreta¨, celebrated Holy Mass there and met with the Archbishop of Trani, Mons. Giuseppe Carata, notifying him about the conversation that he had with Cardinal Ratzinger. Letters of Mons. Guízar to the books of LuisaMons. Guízar, relying on the words spoken by Cardinal Ratzinger, “all the writings of Luisa must be approved”, wrote the recommendation letter that appears at the beginning of the book “The Hours of the Passion” with the date of January 22nd 1991. 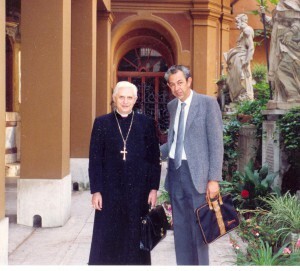 In 1991 His Excellency Carmelo Cassati was the successor of Mons. Carata in the Archdiocese of Trani; Mons. Guízar told him about the words of Cardinal Ratzinger referring the opening of Luisa´s Cause. Therefore, His Excellency C. Cassati worked to realize it, much more that his predecessor had the intention of doing so. In a way that thanks to our Supreme Pontiff Benedict XVI, the process of Beatification of Luisa is in course, so that all her writings can be approved, as he said.Book “Origin of Man: Creation or Evolution?” In September of 2001, my father and I went to Italy and had a brief encounter with Cardinal Ratzinger. After greeting him my dad reminded him that previously he had talked to him about Luisa Piccarreta and her writings and about Blessed Annibale Di Francia; later I told him that I had written a book about the way man had been created by God and God’s creative plan for humanity, the sublime state of the first man, Adam, his original sanctity, taking it from the writings of Luisa, and how God wants to make humanity to go back to that state of original sanctity, establishing the Kingdom of the Divine Will on earth as it is in Heaven, through Luisa. At the end I told him that I had mentioned him and quoted something that he had said about the writings of Luisa to Mons. Guizar and gave him the book in Italian. In the year 2000, I, Alejandra Acuña, daughter of José Luis, wrote and published the book: “Origin of Man: Creation or Evolution?” against Evolutionism, also with a brief letter of Mons. Ricardo Guízar Díaz. In the note No. 32 I quote the famous phrase said by Cardinal Ratzinger to Mons. Guízar, with the authorization of the Bishop himself. At the beginning of 1996 the Archdiocese of Trani-Barletta-Bisceglie obtains from the Congregation for the Doctrine of the Faith, presided by the Cardinal Ratzinger, the permission of photo copying all the volumes of Luisa that were found in the files of the Congregation since 1938, in order to be read and studied by the authorized people by the Tribunal of the Cause of Luisa, in order to be censed and approved by the Competent Authority, and finally to be published. In February of 1994 the Archbishop of Trani received from the Congregation for the Cause of the Saints the Nihil Obstat to initiate officially the Diocesan Canon Process for the Cause of Beatification of Luisa and in the solemnity of Christ the King, in November 20th 1994, in the Mother Church of Corato, the Cause of Beatification of the Servant of God Luisa Piccarreta initiates with a solemn Mass. He did the same in 1992, giving another special letter for the book “Selected Passages” and further on in 1999 for the book “The Virgin Mary in the Kingdom of the Divine Will”. Meanwhile, in Mexico the interest for the writings of Luisa was growing, which were being translated by my father and handed out privately in the form of photo copies, and because of this he thought in editing “The Hours of the Passion”. In order to make it orderly, in communion with the Church, according to the advice of Cardinal Ratzinger, he first informed the Bishop and asked a letter from him. They also talked about the need to open the Cause of Luisa´s Beatification in the Archdiocese of Trani so that the Archbishop of Trani could ask the Congregation for the Doctrine of the Faith, copies of the writings of Luisa so that they could be revised and approved. In October of the same year of 1990, Mons. Guízar Díaz travelled once again to Rome to assist to the Synod of Bishops about the priestly formation, and there providentially was present in the Beatification of Father Annibale Di Francia. As an answer my dad received a letter with the heading “Joseph Cardinal Ratzinger” in which the Personal Secretary confirmed having received the shipping and assured the blessing of the Cardinal. “I annex other paragraphs selected from different volumes of Luisa, which some of them make us see a luminous future for the Holy Church and for humanity, and a brief biography of Luisa”. In the street I met once again the Personal Secretary, to whom I also spoke about Luisa, who didn’t know, now he knows about her…I will be able to write to him, giving them more writings. More or less these were the main ideas. He thanked me and said that I should continue to do everything with the Bishop. I said goodbye. LUISA EN ESPAÑOL, S. C.